Blog post #2! Look at me go! My lovely neighbor Sherron from www.simply-gourmet.com issued a bread throwdown. Ok, not really. Sherron is really sweet and would never turn cooking into a competitive sport. She is part of a group (#twelveloaves) that encourages people to bake bread and submit their experience to share with others. Sherron made a Pinca, a Croatian Easter bread. I know, crazy impressive with just the name alone. However, she went a step further and adapted the bread by making it gluten free. Wow, right? Others submitted Italian Easter Bread, Hot Cross Buns and American Irish Soda Bread. What would I submit and would anyone care? Before I even begin, I have one small issue. Bread is my Waterloo. My mother hated making anything with yeast, so we didn’t. Not one yeasted roll or bread loaf. Nada. My mother has hundreds of cookbooks and reads them all cover to cover. Any recipe that called for yeast might as well have had arsenic as the first ingredient. She just wasn’t making it. I grew up with a very healthy fear of all recipes with yeast in it. After getting sick of buying bread with inferior and rather scary ingredients, I decided to go out on a limb and get a bread maker. 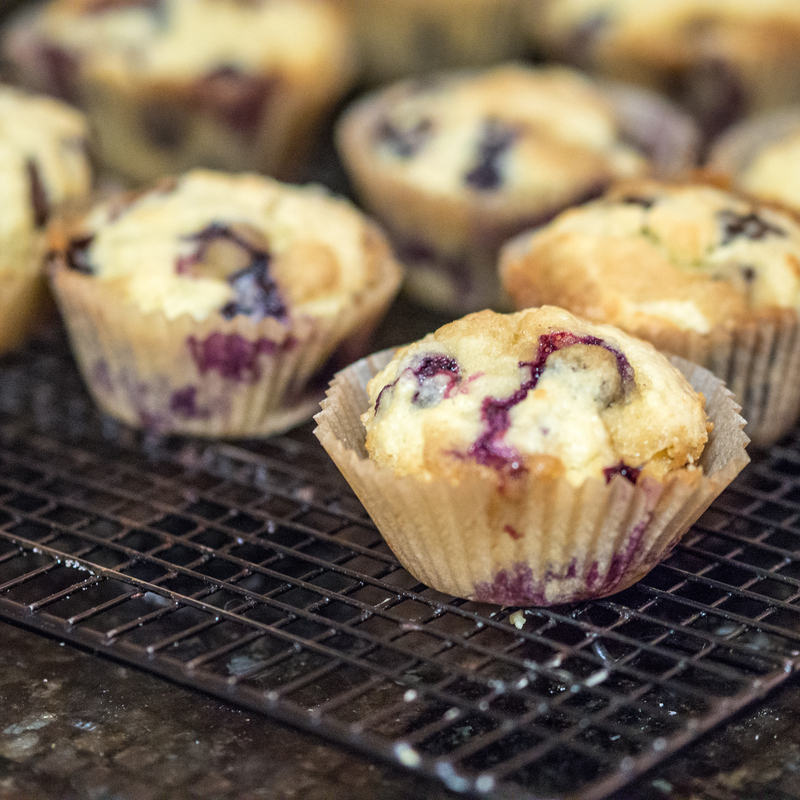 King Arthur Flour made it sound very easy, and it was. Dump everything in the bread maker and push a button. Viola! Bread. Organic bread for cheap, once you factored out the cost of the bread maker, of course. Factoring in the bread maker cost and you are looking at a few months before break even. Challah is my favorite bread to make in the machine. My kids consider that white bread. I do pity them when they grow up and realize white bread is something totally different. Do I stray from the machine? No. Not. Ever. However, given the lovely pictures and descriptions of the breads submitted, I didn’t think my bread machine bread was going to cut it. Reading through various recipes, I realized most ingredients for modern breads are recorded by weight, not volume. Alton Brown did this in his Good Eats show and I turned the channel. 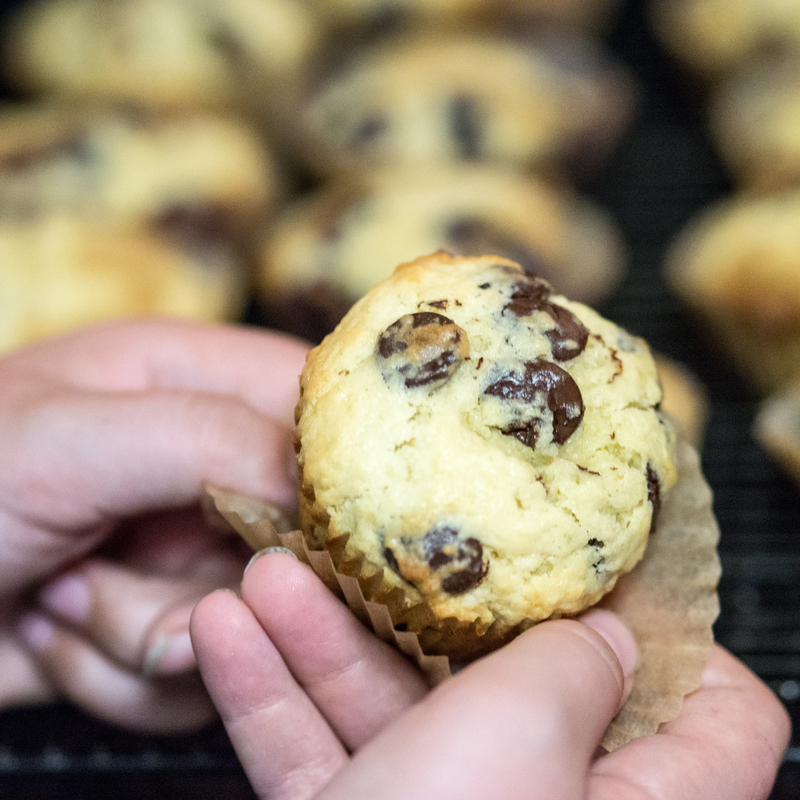 Many bakers weigh their ingredients to ensure consistency and success. This level of precision and scientific interloping causes me fits because I am a cups and teaspoon girl. Getting the scale out, setting it to zero with a bowl on it and slowly adding the ingredients one at a time takes the joy out of cooking for me. Too many “things” cluttering up my workspace and putting barricades between me and the food. 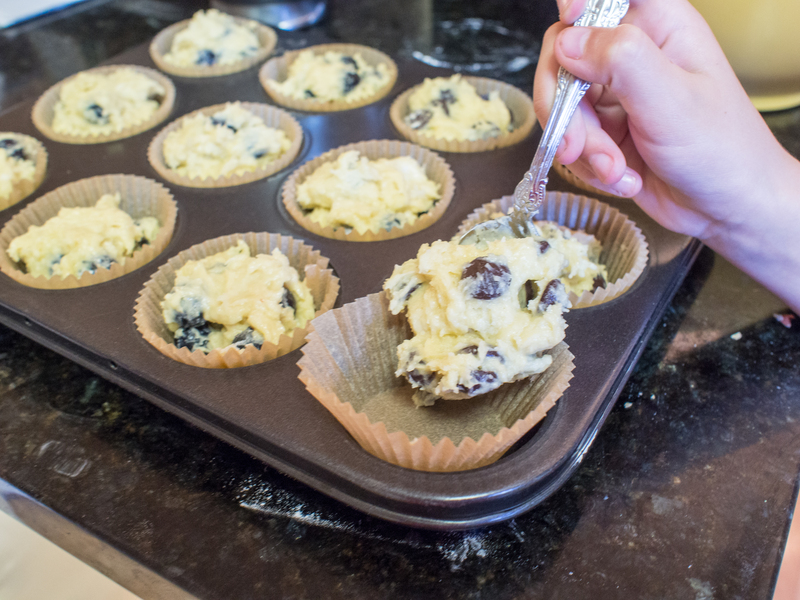 The baking process becomes slow and laborious and the constant weighing really takes the expertise of the cook out of it. Historic cookbooks describe baking bread as among one of the greatest accomplishments a housewife can perform. Besides making your own yeast from potatoes and hops and dealing with what can only be described as less than consistent yeast and flour inputs, the bakers of yore had to contend with the fire. That’s right, actual fire. Now we have instant yeast and an oven that (hopefully) provides a consistent temperature. We can even buy extremely consistent flours. Had women of yore had access to SAF yeast, consistent flour blends and an oven, I very much doubt these women would have had to weigh anything. So, I wasn’t weighing anything, leaving me to find a recipe with ingredients by volume. I combed all of my old sources of historic recipes and nothing seemed to match the rather seasonal nature of the breads submitted. I found an Easter Babka recipe that was rooted in Polish tradition and asked my husband if he remembered his very Polish grandparents making Babka for him. Nope. Another recipe killer for me was that the recipes I found for said Babka had dried fruits as ingredients. I dislike dried fruits in my baked goods. Dislike is a kind word. 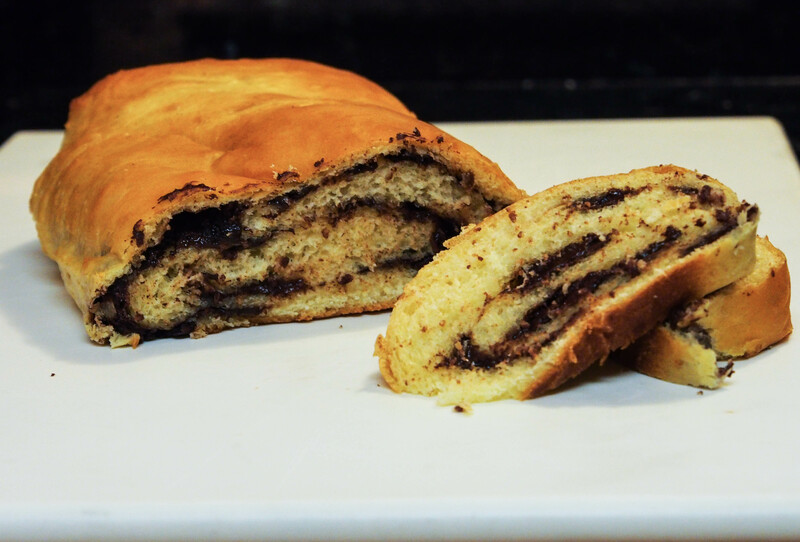 But, the word Babka reminded me of one of my favorite Seinfeld episodes: The Dinner Party. I am a HUGE Seinfeld fan. Jerry and Elaine wanted to bring a Chocolate Babka to a dinner party. The bakery had sold out of the Chocolate Babka and only had a Cinnamon Babka, which Elaine considered the “lesser Babka”. Hilarity ensued. So, I decided to make a Chocolate Cinnamon Babka. One, it has chocolate, two, I heart Seinfeld, and three it kind of (sorta) went with the Easter theme of the #twelveloaves challenge. Besides, who wouldn’t want to unite the lesser and greater Babkas to create a super Babka! Also, this recipe exemplifies how I think our cooking should have evolved without the influence of prepackaged “food”. 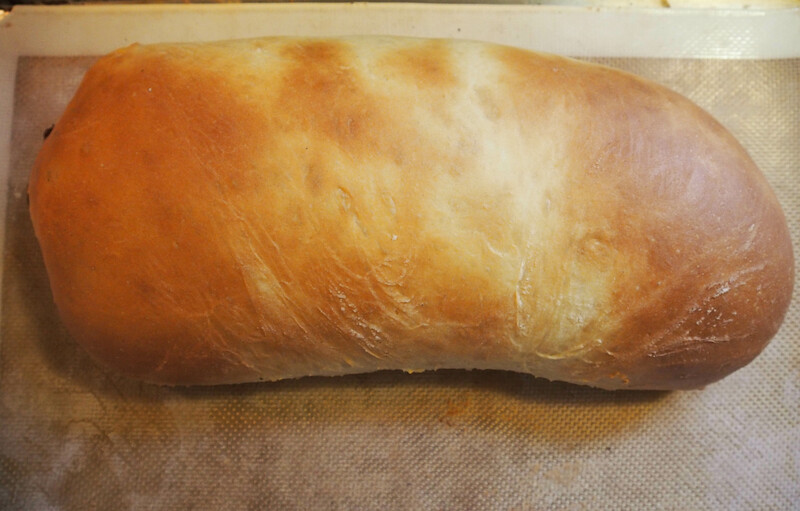 Here a lovely, simple sweet yeast bread is combined with ingredients far more accessible now. To pull off Chocolate and Cinnamon Babka successfully, time, patience and quality ingredients are required. There are no Babka mixes or pop open tubes in the grocery store. Also, modern conveniences like standardized flour, instant yeast and great chocolate and cinnamon make this dish relatively easy. Martha Stewart’s receipt for Chocolate and Cinnamon Babka is the easiest to find on the internet. However, it makes 3 loaves and calls for over 2 lbs of chocolate, the best of course! Not wanting to spend nearly $30 on just chocolate for a bread that might fail, given my lack of measuring, I wanted to look for something a tad cheaper. Also, this bread kind of violated almost all of my “low carb” rules. One could argue that the cinnamon helps regulate the blood sugar, but seriously, this recipe is clearly a splurge. Combine the yeast and the milk and set aside. Cream the butter and the sugar in a stand mixing bowl. Add the vanilla. Incorporate each egg yolk separately. Allow 30 seconds to pass before adding each yolk. Gradually add the flour and the salt. 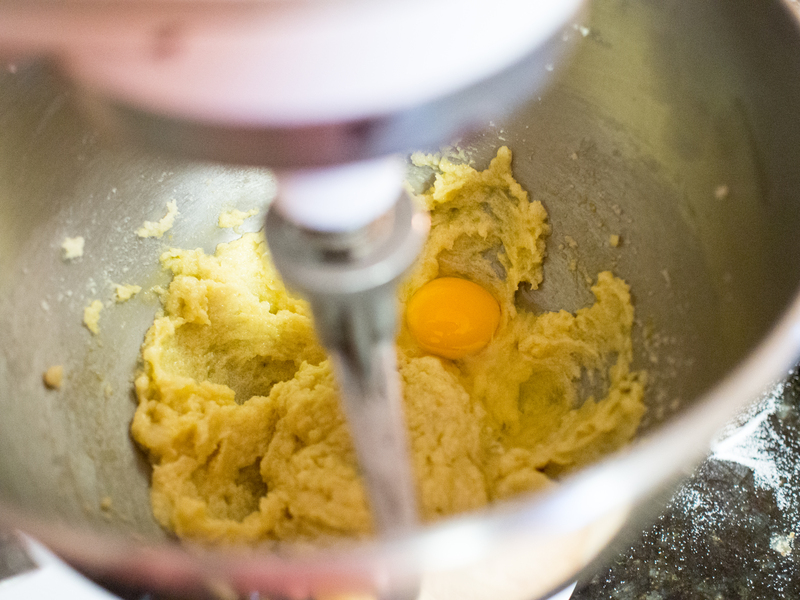 After the flour and salt are well combined with the other ingredients, add the milk and yeast mixture. 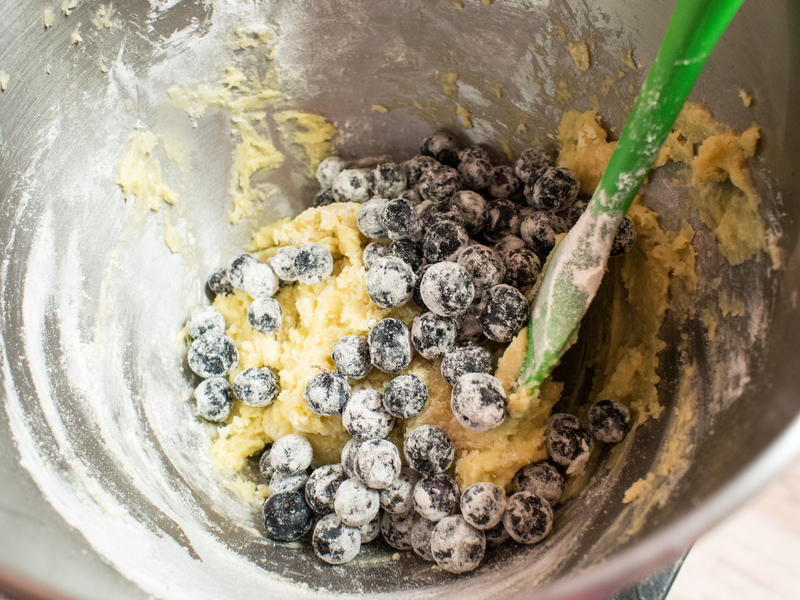 Continue mixing until a soft dough is formed. 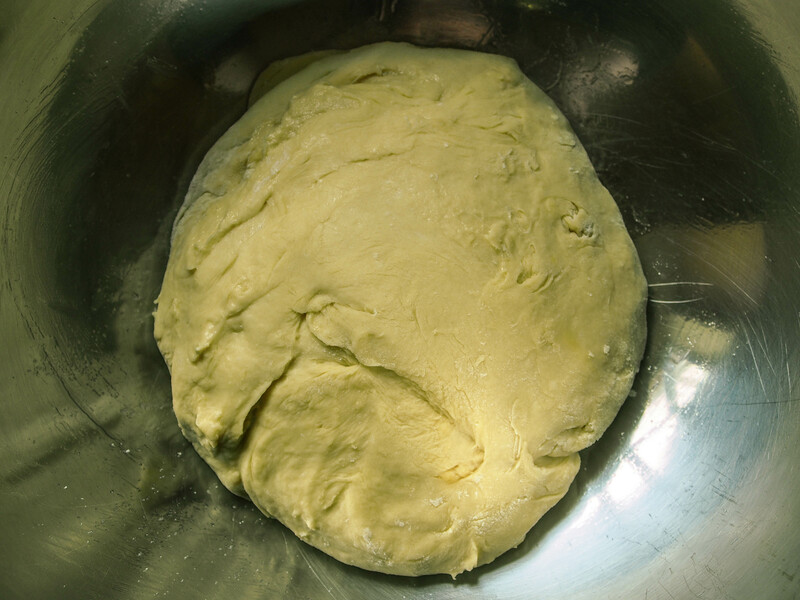 Dump the dough on a well floured surface and knead by hand until you have a soft, supple and golden dough. The original recipe called for 3 ½ cups of flour. 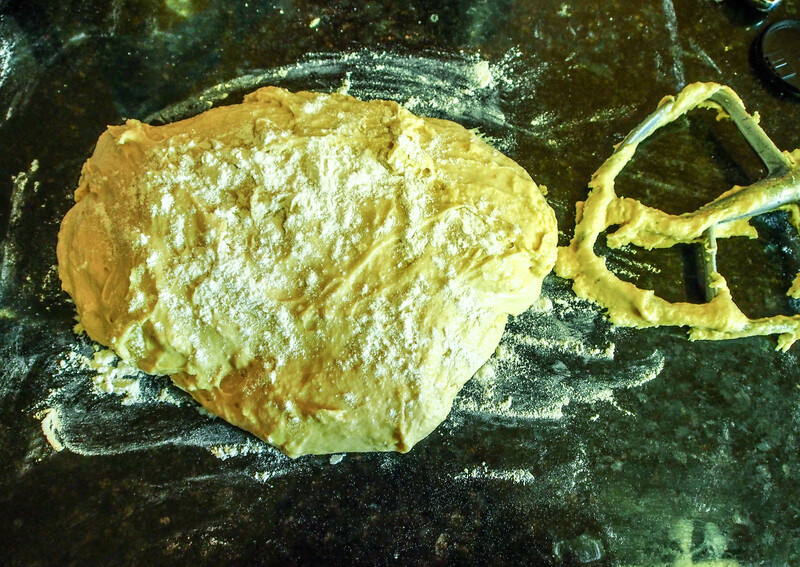 My dough was a sticky, unworkable mess at this point, as you can see. One of the dangers of going by volume. But who doesn’t like a dash of danger, right? I added probably about ½ a cup more to get the dough “soft and supple”. So, for the recipe above, I increased the amount of flour to 3 ¾ cups of flour. You may need to add more. Just the nature of not weighing the ingredients. 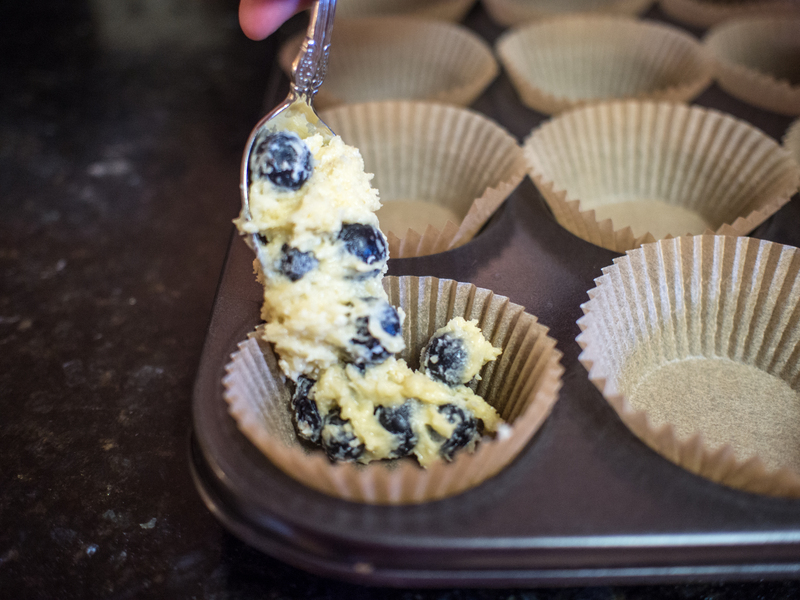 Place the dough in a lightly oil bowl and cover with a damp cloth and let it rise for 2 hours. 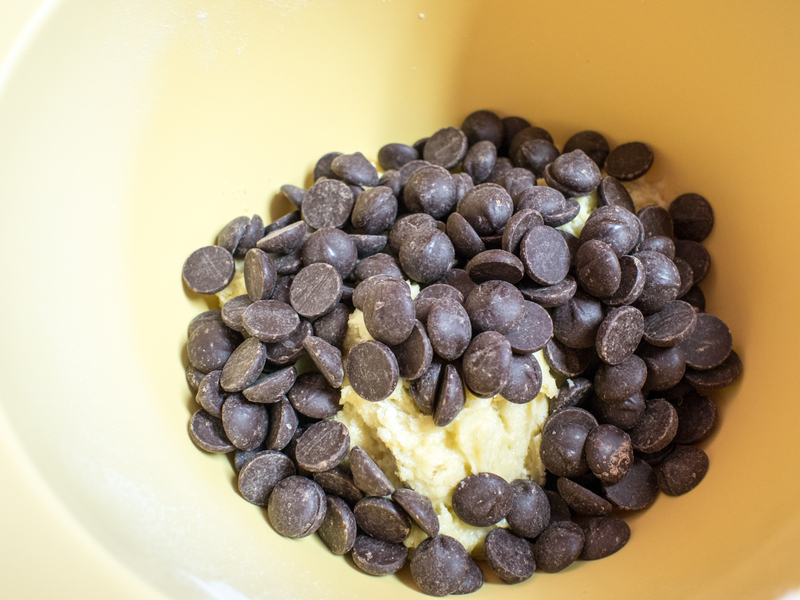 Just before the end of the rise, combine the chocolate, cinnamon, butter and salt in a small bowl. 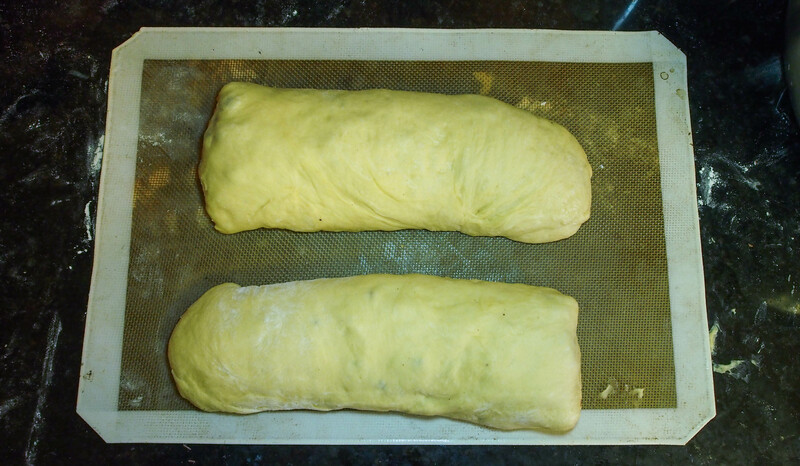 Once risen, roll the dough out on a floured surface to a thickness of 1/4th inch think. 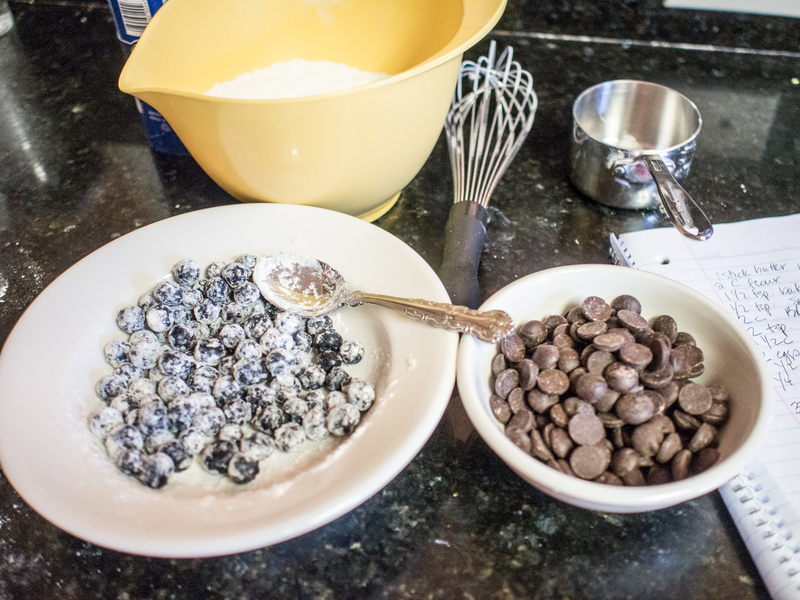 Place the chocolate mixture over the dough sheet, creating a smaller chocolate rectangle in the middle of the dough rectangle. 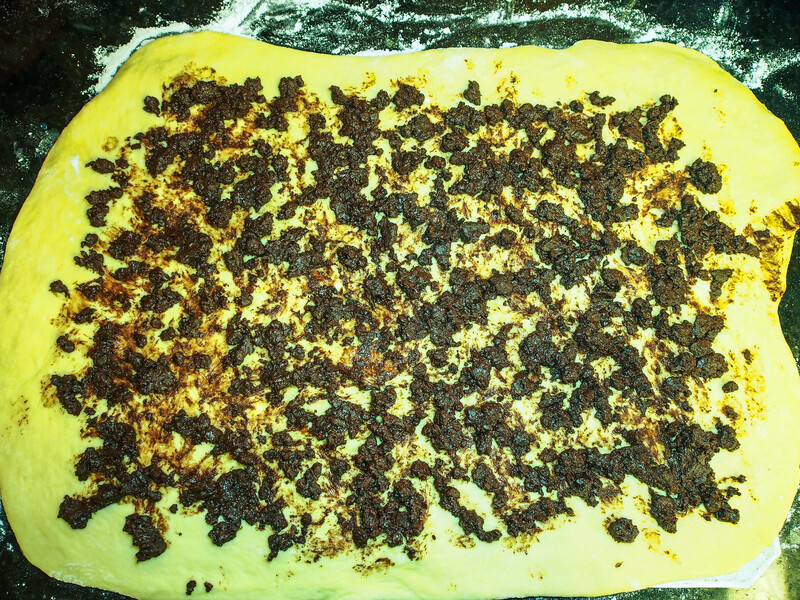 Roll the dough lengthwise and pinch the seams to keeps chocolate leaks to a minimum. I cut my log in half and pinched the ends to form two logs. You can get really fancy and cut the log into two sections about three quarters of the way through and braid the log. When I read that in the original instructions, I was like, sure I can, or, I can just cook the log and not make a hot mess out of this thing. I never mastered braiding inanimate ribbon and now I am supposed to braid soft, yeasty dough? Nope. Not gonna happen. Place each log (or the single braided loaf for the over achievers out there) on the baking sheet you intend to use, cover with a damp cloth and let rise again for another 2 hours. Bake in a 350F degree oven for 15-20 minutes, turning the baking sheet halfway through the cooking time. This bread disappeared. I had two loaves for less than 24 hours. It’s that good. Elaine would not consider it the lesser Babka! This entry was posted in Breads and tagged #twelveloaves, Babka, Bread, Chocolate Babka, Easter, Seinfeld on March 17, 2013 by dawn of food.